Friday in South Florida will start with a mix of sun and clouds with shower activity expected to pick up across Miami-Dade and Broward later in the morning and into the afternoon. Deep tropical moisture is continuing to feed in from the system that is hovering near the Yucatan Peninsula. The National Hurricane Center has put a 70 percent chance of developing that system into a depression over the next 24 hours. An aircraft is scheduled to go investigate the low later Friday and once that happens, we will know much more about which direction the low will move. Right now models are split, with some taking it on a more westerly track, towards Texas. With that scenario, we will see a little less rain and wind through the weekend. Other models take it toward the Florida panhandle. 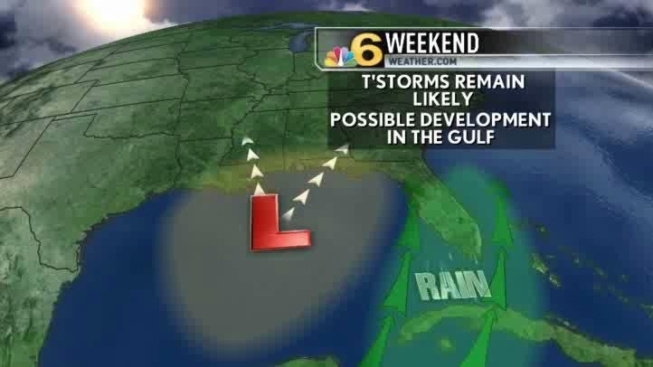 With this scenario, we will have higher rain chances and wind in the forecast through the weekend. It is something we will continue to monitor closely. With that said, we will go with high rain chances through the weekend, and highs remaining in the mid 80s.